Are you already in the autumn mood? I can’t say I really am, as it is getting hotter each day here in Singapore, but at least we do have some seasonal products, like pumpkins! And what do you do with pumpkins? Bread, right?? 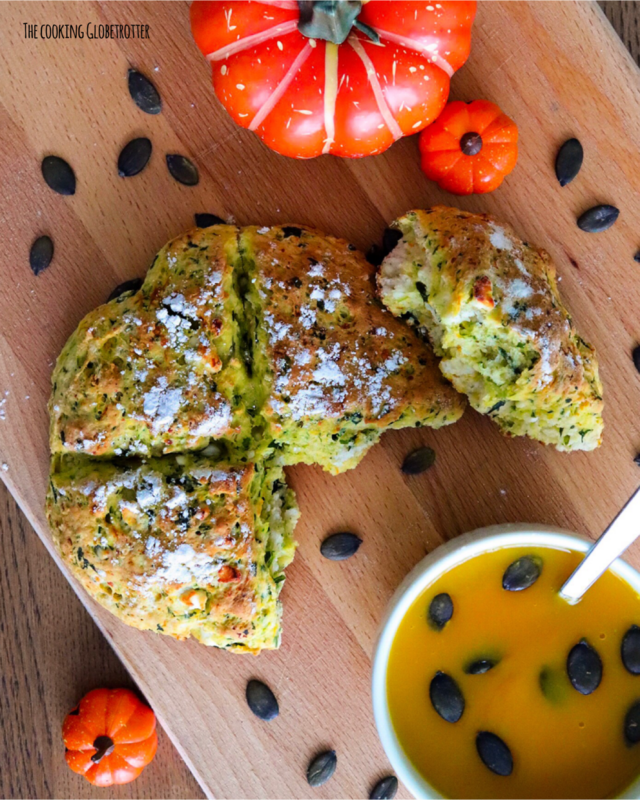 I think everyone knows how to do soup, so let me share with you a recipe that will be the perfect pairing for your pumpkin soup: pumpkin bread with spinach and feta cheese! Ok, first things first: I got this recipe from Dean Brettschneider‘s book “Bread”. I had the pleasure to meet him during one of his baking classes and it was amazing to see him in action. He not only has the best bread on this island but is also extremely passionate about his work. No affiliation here (I can only wish..), just truly a big fan. I’ll share my version of it, as I made minor changes to it. 1. Warm up the oven at 200° C if using a fan and 220° C if using a conventional oven. 2. I used my kitchen aid with the dough attachment to mix the dough, but you can of course also do it by hand. 3. Start by pouring the flour (500g), salt (8g) and baking powder (40g) into your bowl, mix them slightly. 4. Pour in the butter (65g) in chunks and at room temperature and mix shortly. 5. Add a pinch of pepper to it and mix. 6. At slow speed pour in the milk (350ml room temperature) slowly and stop mixing once you’re done the pouring. No overmixing! 7. Now add the chopped spinach (100g, you can use frozen ones but do cook them first as to get rid of all the water and let them come back to room temperature), feta (100g) roughly crumbled with your fingers, and pumpkin (100g, cooked) and gently mix. You may have to use your hands to fold everything in nicely at this point. 8. Divide the dough into 4 equal parts, make a round shape out of each one and place them on a baking tray lined with baking paper. 9. Flatten them down slightly and gently as to make a huge bun, lightly dust with flour and decorate with pumpkin seeds if you like (I forgot, as you can see..). 10. Let them rest, covered, for 15 minutes. 11. Before baking them, cut them with a knife into quarters, but don’t cut through, just go halfway. 12. Bake for 20 minutes, remove from the oven and let them cool down on a wire. 13. Enjoy with your favourite soup! Warm up the oven at 200° C if using a fan and 220° C if using a conventional oven. I used my kitchen aid with the dough attachment to mix the dough, but you can of course also do it by hand. Start by pouring the flour (500g), salt (8g) and baking powder (40g) into your bowl, mix them slightly. Pour in the butter (65g) in chunks and at room temperature and mix shortly. Add a pinch of pepper to it and mix. At slow speed pour in the milk (350ml room temperature) slowly and stop mixing once you're done the pouring. No over-mixing! Now add the chopped spinach (100g, you can use frozen ones but do cook them first as to get rid of all the water and let them come back to room temperature), feta (100g) roughly crumbled with your fingers, and pumpkin (100g, cooked) and gently mix. You may have to use your hands to fold everything in nicely at this point. Divide the dough into 4 equal parts, make a round shape out of each one and place them on a baking tray lined with baking paper. Flatten them down slightly and gently as to make a huge bun, lightly dust with flour and decorate with pumpkin seeds if you like (I forgot, as you can see..). Let them rest, covered, for 15 minutes. Before baking them, cut them with a knife into quarters, but don't cut through, just go halfway. Bake for 20 minutes, remove from the oven and let them cool down on a wire. Enjoy with your favourite soup!